Ministers launched the Project Ireland 2040 National Planning Framework today in Sligo. THE GOVERNMENT PLANS to double current housing output over the next 10 years to deal with a big spike in population that’s expected to come. To do this, it is planning to take over vacant spaces and invest billions in urban regeneration, among other measures. The NPF is a strategy document which lays out how the government will handle future population growth. Based on ESRI projections, Ireland’s population is expected to grow by one million people by 2040. To cope with this rise in population, strategic planning will be needed to ensure the needs of Irish citizens are met in essential areas. Not least of these is housing, which is currently one of the more pressing issues in Irish society, due to a lack of adequate supply to meet the ever-growing demand. To address this growth, the NPF lays out a number of key areas that it will focus on with regards to housing and sustainable urban development. A key commitment is to deliver housing that is properly planned, in areas with adequate transport links and amenities. To this end, Ireland 2040 plans that 40% of all future housing will be in existing built-up areas – meaning mostly cities and big towns. In order to facilitate this growth, Ireland 2040 commits to providing new Metropolitan Area Strategic Plans for the five major cities (Dublin, Cork, Limerick, Galway and Waterford). According to the NPF, these plans enable the adoption of “an integrated, consolidated and coherent approach to regional planning” – meaning careful planning will manage the growth of the cities. The government said that projections show that cities Galway, Cork and Waterford will all grow by 50% each in this period (up until 2040). The plan states that over the next 10 years, housing construction will be ramped up to an average of 25,000–35,000 new homes annually. This is in order to deal with future population growth and to address the current demand-supply imbalance. NPF forecast models show that at least 500,000 new homes will be needed long-term by 2040. The plan says that this will effectively double housing output when compared to 2016/2017. However, due to issues with recording of new builds, the Housing Minister said last month that he didn’t actually know how many homes were built last year. 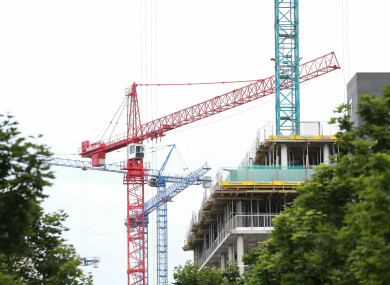 The minister said last month that work was underway to give a true figure for the number of homes actually built last year and in the second half of 2016 and that this would be completed “in the second quarter of this year”. In terms of proper planning, the NPF commits to ensuring that an approach is taken to manage growth and combat sprawl of cities and urban areas. As well as general new builds, the NPF commits to providing 112,000 social homes by 2027. Under Rebuilding Ireland – the government’s Housing Action Plan – over 26,000 new homes are due to be built between 2016 and 2021. This means the government is committing to providing at least 86,000 new social homes over a six to seven-year period – a significant ramp up in production. Long-term leasing, acquisitions as well as new builds are likely to be included in this figure. The plan references 26,000 or people on the housing list having their social housing needs met last year. This figure includes a large number private tenancies for people who are in receipt on the Housing Assistance Payment (HAP). The government also today announced a new €2 billion Urban Regeneration and Development Fund. According to the NPF, this fund is to “promote coordinated investment in the renewal and redevelopment of our cities and towns”. This is a key part of Ireland 2040, and will involve huge investment in housing for different areas across Ireland’s five major cities. As well as this, the government announced a new “National Regeneration and Development Agency”. The purpose of this agency is to work with local authorities to identify and release vacant land banks in cities and towns that could be redeveloped and have housing built on them. An example of one of these is 18 acres of publicly-owned brownfield sites in Galway city that can be developed and used to attract people back to the city. The final main point the government announced is a plan to develop a number of publicly owned sites for social housing primarily, but with a mix of private and affordable homes on the land also. While the NPF contains a number of the commitments laid out in Rebuilding Ireland for delivering private and social housing, it also widens the scope and looks towards the future. “Project Ireland 2040 represents an important shift from previous approaches to long-term planning and investment by Government,” said Housing and Planning Minister Eoghan Murphy at the launch today. The plan has been met with a fair bit of criticism from opposition quarters, however. “Today’s ‘launch’ is nothing more than a major marketing campaign designed to promote a government which has failed to meet its own targets to date,” said Fianna Fail public expenditure spokesperson Dara Calleary. Major projects being unveiled as part of the NDP such as Metro Link and additional social housing provision were already included in the previous Capital Plan, but just haven’t been delivered on. Email “Empty lots in cities to be snapped up to help achieve 35,000 new builds a year”. Feedback on “Empty lots in cities to be snapped up to help achieve 35,000 new builds a year”.